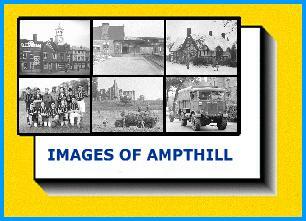 Ampthill Images. Access to over 6000 old images,from the late 1800s. Photographs,postcards,glass plates,and cine film frames. A wide range of subjects. Here are old images taken from photographs, postcards, glass plates, cine films, slides and maps. These images cover the years from the late 1800s. The objective has been to produce images for viewing on screen rather than to produce photos for downloading and printing. The images have been structured into a number of series covering different topics - such as agriculture, events, buildings, church life, people etc, and within each series there are albums for different subjects. For example within the agriculture series there are four albums, agricultural shows, farming life, wartime farming camp, and young farmers. Within each album the images are sorted into alphabetical order or date order or a combination of both. Because of the large number of images on this website there needed to be a balance between image quality and site size. The image size has therefore been limited to 11.5cm x 8.5cm to produce a reasonable image. Enlarging any images is not recommended, as the image quality will deteriorate. The original material was of variable quality. and where possible it has been repaired, manipulated, and improved, but there is a limit to what can be done, and some images are not that brilliant. For example some of the press photographs were never used because the flash didn't operate on indoor photos, or they were over or under exposed, or out of focus, etc. Luckily the negatives were not destroyed. These images have been included here because of their rarity value. Hope you find what you are searching for - good hunting.